Walls like this abound in Aida. 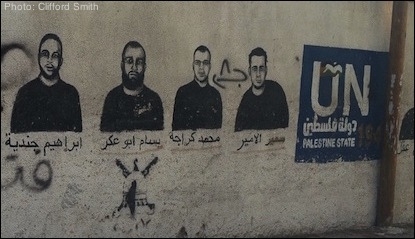 The names include Ibrahim Jundiya (left) and Bassam Abu Akr (2nd from left), both in jail for masterminding suicide bombings in Israel. The United Nations Relief and Works Agency for Palestinian Refugees claims that its mission is humanitarian, apolitical, and dedicated to non-violence. 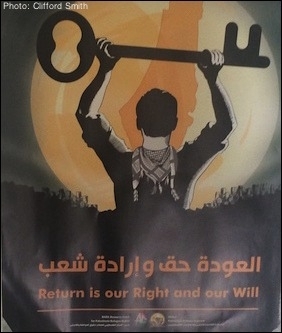 Yet UNRWA's critics claim otherwise, citing evidence of resistance to resettling refugees from the 1948 Arab-Israeli war, a conflict which resulted in an unprecedented legal claim to the so-called "right of return" for descendants of prior residents of Israel. This summer, I decided to visit an UNRWA camp and judge for myself. With a female Arab reporter serving as my guide, I set out from Jerusalem for the UNRWA camp in Aida, a West Bank town just on the other side of the security fence. Aida is not like what one might imagine a "refugee" camp to look like. There are no tents, temporary offices, or makeshift medical facilities. Instead, it resembles a slum, similar to ones in the U.S., but covered in political graffiti including militant anti-Israel slogans and heroes of the "resistance" who have been "martyred" or taken prisoner. UNRWA's critics claim it has resisted resettlement of refugees from the 1948 Arab-Israeli war. My guide arranged for me to meet the director of the camp, Ibrahim Abu Srour, by telling him of my connections to Congress. Abu Srour proudly explained how UNRWA moved from providing tents in 1950 to now providing healthcare, education and cultural enrichment. The one thing it can't provide them is sufficient jobs — 35 percent of Aida residents are unemployed. Abu Srour stressed that the camp is "neutral" and not "political." By "political," he clearly meant part of Hamas, the al-Aqsa Martyrs' Brigades or other terrorist groups. Anyone caught using their resources for "politics" wouldn't receive UNRWA's help. Paradoxically, he also said that his staff documents every interaction camp residents have with Israelis and pays to fix their houses when damaged by Israeli retaliation against terrorist attacks. 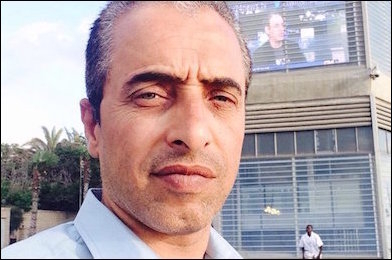 Camp director Ibrahim Abu Srour claims that Aida is apolitical. Abu Srour showed me a recently added source of pride, a one-million-dollar playground built as part of UNRWA's new Healthy Camp Initiative. Far nicer than most other parts of the camp, it includes a soccer field and an artificial river. He stressed the importance of summer camp. "It is good for them to refresh, to use energy in a correct way." Other UNRWA summer camps, however, have been known to teach hatred of Jews and anti-Israel propaganda. Indeed, complaints of anti-Semitic curriculum and political indoctrination at UNRWA schools abound. Next, I was invited to the BADIL Resource Center for Palestinian Residency and Refugee Rights, an NGO that has a clean, modern-looking facility in Aida reminiscent of a YMCA, but covered with wall paintings of militant Palestinian leaders, alongside numerous posters featuring slogans like "The right to return is our will," and "The right of return is not subject for negotiation." The "key of return" motif is ubiquitous in Aida. I was introduced to a young woman in her mid-20s who, unlike my guide, wore a hijab. She explained that they were helping Palestinians who suffered because of the "nakba" (catastrophe), referring to the foundation of Israel. She played a video highlighting the camp's work. It included footage of the camp's dance troupe touring around Europe singing songs demanding the "right of return." More disturbingly, the video described the "nakba," simply as Jews expelling Arabs and stealing their land. There was no mention of decades-long Jewish migration, the deep historical ties of Jews to the land of Israel, the U.N. partition or the role of Palestinian militias and Arab governments in starting the 1948 war. I was given a copy of BADIL's annual report, which included a map labeled "'Maximum Land with Minimum Palestinians: The Ongoing NAKBA since 1917," incorrectly implying there was no Jewish presence in Israel in 1917 and showing areas the "colonizers" came to control in subsequent years. UNRWA is indeed a shameful hatchery for destructive ideologies. Finally, I was shown a room housing a collection of mundane artifacts from the time before the 1948 war. "So they remember their villages and what they lost." Upon departing, my guide said to me, "They say they aren't political, but everything they do is political." Of course, she was right. Visiting Aida made it abundantly clear that UNRWA is indeed a shameful hatchery for destructive ideologies. Its clients are better educated than most others in the Middle East, but UNRWA is helping perpetuate the destructive culture that condemns them to lives of misery.